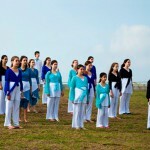 The Li-Ron Choir represents the city of Herzliya and is conducted by Ronit Shapira. The Choir was founded in 1980 as the Gordon Elementary School Choir in the Neve Amal neighborhood. Today the Choir operates as the Center of Vocal artistry and is a non-profit organization. The Center holds workshops for children and youth: the Discovery of the Voice in the Body, the Understanding of the Basics and “Secrets” of Music and the Integration of Movement and Acting in the Singing of the Choir. The rehearsals are held in the Yad La’banim Museum, Ha’banim Street Herzliya. The uniqueness of the Choir is in the way the conductor, Ronit Shapira emphasizes the spiritual aspect of song; the search after the sound that is hidden from the ear and develops the singer’s ability to listen to his inner being. Composers who wrote for the Choir and accompanied them in the rehearsal hall, like Prof. Andre Hajdu, Prof. Yehezkel Broun, Menachem Wiesenberg and Sara Shoham are in agreement that the Choir members demonstrate an exceptional ability to express drama, emotion and technical skills in a sophisticated and artistic manner. In October 2017, the choir participated in the International Choir Competition in Kalamata, Greece, and won two gold medals. The choir took first place in the Category for Religious music and was invited to perform at the Grand Prix with the top 8 choirs, out of 52 participating. In September 2015 the choir represented Israel in a competition taking place in Torre del Lago Puccini, Italy, and won two gold medals in categories: Religious Music and Folklore Music. In July 2013 the Choir participated in a liturgical musical competition held in Rome, Italy. The Choir won 2 gold medals: liturgical music from different periods and contemporary liturgical music. In July 2011 the Choir and the Ensemble participated in an international competition in Wernigerode, Germany and won a gold medal for each of the categories in which they participated: Youth, Israeli folklore and liturgical music. In July 2009 the Choir and the Ensemble participated in a competition that was held in Bratislava, Slovakia. They won gold medals Israeli folklore and liturgical music. In July 2006 the Choir represented Israel in the Choral Olympics that were held in Xhiamen, China and won a gold medal in the category of youth choirs and a silver medal in the category of folklore. In July 2004 the Choir participated in the Choral Olympics in Bremen, Germany and won 2 gold medals. In October 2002 the choir was invited to represent Israel in a world conference held by the 3 monotheistic religions for peace and brotherly love in Girona, Spain. In the symposium the children’s choir from Montserrat, Spain represented Christianity and the children’s choir from Morocco represented Islam. In July 2001 the Choir represented Israel in the renown competition in Europe that was held in Tolosa, Spain. The Li-Ron Choir won first place in the category of children’s choirs. The Choir also won gold medals in the competitions that were held in Grado, Italy (2000); Salsomaggiore, Italy (1998); Giessen, Spain (1997); Netanya, Israel (1996); Budapest, Hungary (1995); Wales, England (1991). Discography includes the Schindler’s List original soundtrack album (1994) for which it recorded a folk Yiddish song; A Prayer for Peace (1996) in memory of Israeli prime minister Yitzhak Rabin; Smoke and Ashes (1998) featuring Ladino songs; Berale Come Out (2000); The Little Prince (2003); Wind and Sand (2006) and various albums featuring the choir’s expanding repertoire from the years of 1996, 2002, 2006 and 2010. Ronit Shapira, who established the “Li-Ron” Choir, serves as its conductor and musical director. She is a graduate of the Music Teachers College and the Music Academy of Tel Aviv University, runs workshops with the title “Uncovering the Voice”, and is an expert in the methodology of music education and choir conducting. Mrs. Shapira won the title “outstanding conductor” in Salsomaggiore, Italy and the Education Award in the city of Herzliya .